Hyaluronic acid is a natural substance found in skin and works to trap water and maintain the intercellular space within the dermis. As our skin ages, hyaluronic acid, collagen and elastin are gradually lost from the dermis. The end result is volume loss, skin laxity, and wrinkles. Restylane is a non-animal stabilized hyaluronic acid based dermal filler. It was FDA approved for the treatment of wrinkles in December of 2003, but has been widely used in Europe and other parts of the world for many years. 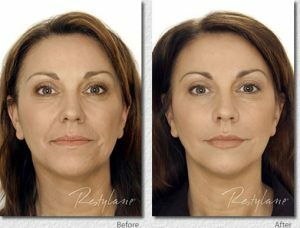 Restylane is used to replenish the dermal volume loss that allows wrinkles to form. It is also used to enhance lips and fill in acne scars. Because it is minimally modified, Restylane has a low incidence of hypersensitivity reactions and requires no skin testing prior to treatment. The chemically stabilized hyaluronic acid found in Restylane can remain in the dermis up to one year but typically we would advise the effects last 9 months on average. This is significantly longer than the collagen based dermal fillers which we no longer use. The clear Restylane gel is injected using a fine needle. It is injected into the dermis below the wrinkle and lifts the wrinkle out to the desired correction. Restylane is injected directly into and around the lip for lip enhancements. Topical or local anesthetic is used to anaesthetize the injection sites. Mild to moderate stinging and burning is common during the injection, while redness and swelling can last for hours or days after the injection. Once injected, Restylane integrates into the dermis and binds water. The results are immediate. It does nothing to hinder the normal metabolism and movement of nutrients and oxygen. Over time, Restylane is gradually reabsorbed without a trace. For this reason, follow up treatments are needed to maintain your results at 6 to 12 month intervals. The amount of Restylane used during your treatment depends on the desired correction. Side effects include redness, swelling, and injection site pain that may last for up to one week. Lip swelling and discomfort can be significant and asymmetry may be noted during the first one to two weeks. Also, small bumps of Restylane may be palpated at the site of injection. These bumps are not usually visible, but can remain for several weeks or months after injection before gradually blending into the dermis. If there is a history of multiple severe allergies or collagen vascular disorders such as systemic lupus or a susceptibility to keloid scars, then the doctor will advise against using dermal fillers and hey should not be used in pregnancy or while breastfeeding.